The history of the U.S. military’s small arms adoption process is filled with “what ifs.” Plenty of great firearms have been turned down, from the FN FAL to the Savage Model 1907. Here are some of the best rifles that were trialed by the U.S. military but never adopted. The semi-automatic infantry rifle was a concept that garnered intense interest during the interwar period. While semi-automatic rifles such as the French RSC 1917 and 1918 and Mauser Selbstlader 1916 saw service during the war, they were rough, unreliable and had excessive recoil due to the full power rifle cartridges they fired. But the concept had immense potential: it provided far faster follow up shots compared to traditional bolt actions and significantly increased the firepower of the individual soldier. After the end of WWI, the U.S. Army looked for a new semi-automatic rifle to replace the M1903 Springfield. John Pedersen, a designer at the Springfield Armory government arsenal stepped up to the plate. During WWI, he developed the Pedersen Device, a bolt replacement that could convert a regular M1903 Springfield into a semi-automatic carbine firing a pistol round. Naturally, he took interest in this new opportunity and[began developing a rifle](http://www.milsurps.com/content.php?r=193-The-Vickers-Pedersen-(Part-One%29) during the 1920s. Pedersen’s rifle was a toggle locked design that fed from 10-round enbloc clips. It fired the .276 Pedersen round, which was designed specifically for use in semi-automatic rifles. It had lower recoil than the standard .30-06 cartridge and allowed a rifleman to fire more accurately, faster. It provided sufficient range and lethality despite having less energy than the .30-06. Unfortunately for Pedersen, the rifle had lots of issues. It required every cartridge to be lubricated with a thin film to function reliably, which made it choke in adverse conditions. The competing Garand rifle, which used a gas operated rotating bolt was far less sensitive. It also couldn’t be chambered in the more powerful .30-06, which the U.S. Army wanted to stick with due to logistical reasons. When the U.S. Army decided that it wanted its semi-automatic rifle in .30-06 in 1932, the Pedersen rifle was effectively removed from competition. A small number were produced for British trials, but nothing came of it. The competing Garand would be adopted in 1936 as the M1 Garand and serve the United States admirably in WWII. Despite the failure of the Pedersen rifle, the idea of a lower-recoil cartridge optimized for semi-automatic action would prove to be an innovation ahead of its time. Semi-automatic rifles in full power cartridges like .30-06, 8mm Mauser and 7.62x54R fell out of favor soon after WWII in favor of those favored in smaller cartridges. Perhaps the greatest praise to Pedersen and his designs would be that of John Moses Browning who called him “the greatest gun designer in the world”. Following WWII, the U.S. military realized that the M1 Garand was rapidly becoming obsolete in the face of new rifles like the Soviet AK and German Sturmgewehr 44. The military wanted a rifle that could fire faster, be lighter and be more controllable. Drawing from experiences with submachine guns and other weapons like the M1 Carbine, the new weapon was to be magazine-fed. A variety of trials were held in the mid 1950s, which included a variant of the Belgian FN FAL and an updated M1 Garand with a box magazine called the T44. Enter the AR-10. Designed in 1955 by Eugene Stoner for ArmaLite, it was a radical design that used an in-line design where the barrel, bolt and stock were all aligned in a single axis for maximum controllability. It also used advanced materials like aluminum and fiberglass to reduce weight. Rounding it off was a pistol grip and raised sights to allow the shooter to get a comfortable cheek rest on the stock while maintaining a good sight picture. The gas system was also different than the external piston systems such as the FAL and Garand. The gas was vented through the gas tube directly into a piston formed by the bolt itself and a chamber in the bolt carrier. This eliminates the need for an external piston and reduces the recoiling mass significantly, resulting in a far smoother shooting rifle. The AR-10 was entered into the 1950s rifle trials, but when a composite barrel (a thinner steel inner tube with an aluminum shroud) failed spectacularly, blowing up, the rifle was deemed unacceptable by the U.S. Ordnance Board. Despite the failure (which was rapidly rectified with an all steel barrel), the rifle got great reviews from the testers. One tester reportedly wrote that the AR-10 was the “best lightweight automatic rifle ever tested at Springfield Armory,” only for his supervisor to erase this statement from the record. It is unlikely that the AR-10 would have been adopted even if the barrels didn’t fail. Springfield Armory had a vested interest in keeping its own design in the running; the T44. That rifle would go on to be adopted as the M14. The AR-10 was adopted by various foreign militaries, where it garnered generally good reviews. Stoner and ArmaLite would go onto design the AR-15 in 5.56, which was eventually adopted by the U.S. military as the M16. But in the 1990s, Stoner returned to the AR-10 design. Incorporating refinements from the M16A2, he would produce the SR-25, a modernized AR-10. The SR-25 was quickly snapped up by elite Special Operations Forces who wanted a durable, highly accurate rifle that required less maintenance and was more consistently accurate than their finicky accurized M14s. It continues to serve on today in various forms, including as the U.S. Army’s M110 Semi-Automatic Sniper System (SASS). In the late 1980s, the U.S. military launched one of it’s most ambitious searches to find a replacement for the M16. The program was called “Advanced Combat Rifle” (ACR). The program wanted to increase hit probability (by 100%!) in stressful battlefield conditions via new technology. Each of the four rifles that reached the second phase of testing used a different approach to increase hit probability. Flechettes, duplex rounds (two bullets in one cartridge) and polymer cased ammunition were all attempted. But the most advanced rifle in the program was the H&K G11. Firing caseless ammunition (a massive innovation on its own), the G11 featured the “hyperburst”, a special firing mode in which the rifle would fire three rounds before the recoil could even be felt by the shooter. Development of the G11 started in the 1960s, with firing prototypes being produced by 1974. The rifle feeds from forty-five or fifty round box magazines, two of which can be carried on the gun itself for rapid reloading. Rounds are fed through a rotating breech into the chamber, and the gun’s entire barrel and breech assembly recoil inside the stock when firing, reducing the recoil impulse. The G11K1 was submitted for adoption to the Bundeswehr and the G11K2 was submitted for the ACR trials. Unfortunately for H&K and Dynamit Nobel, the peace dividend resulted in the G11 being canceled by the Bundeswehr. 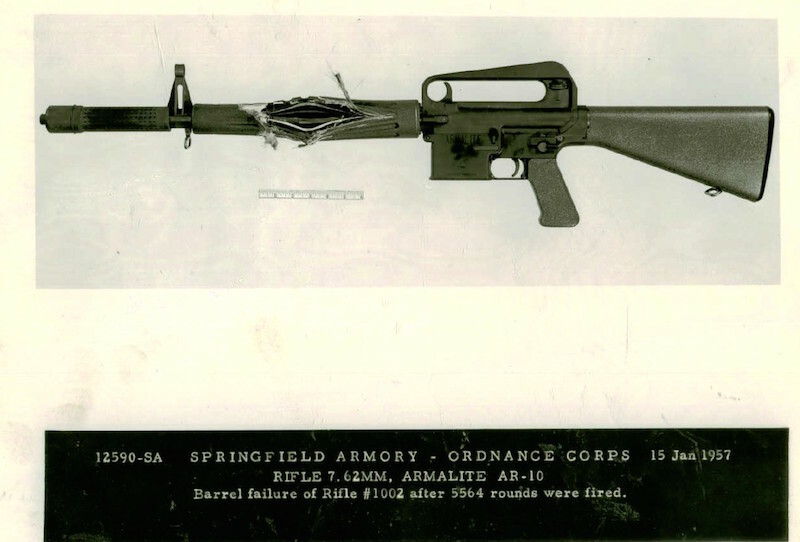 The ACR program also ended around the same time, with the conclusion that the M16A2 was good enough and that none of the prototypes produced enough of a hit probability improvement. However, innovations first created in the G11 are now finally returning to the mainstream. In 2018 the U.S. Army floated the idea of caseless ammunition as part of the new Next Generation Squad Weapons (NGSW) program. Note: Information on the AR-10 primarily comes from the research of Christopher R. Bartocci, published in Small Arms Defense Journal and the book Black Rifle II: The M16 into the 20thCentury. Note: Information on the H&K G11 largely is from the insightful work of Matthew Moss atThe Armourer’s Bench.